SHAIKHA Najla bint Salman Al Khalifa finished third in the 90km Majid bin Mohmmed's Ladies Endurance Challenge race held at the Dubai International Endurance City in Seih Al Salam. Riding Emirates Stables' Magic Glen Harpoon, the Bahraini rider completed this challenging annual event with a total ride time of three hours, three minutes and 26 seconds. The ride was held at a distance of 100km, which was devoted to the stables and private subscription of singles. It was divided into three stages, first yellow flags for a distance of 40 km, the second phase red flags for a distance of 40km, and the third and final phase of white flags for a distance of 20km. Shaikha Futtaim, daughter of Shaikh Mohammed bin Rashid Al Maktoum, Vice-President and Prime Minister of UAE and Ruler of Dubai, secured victory for the second time, riding Nad Al Sheba's Linon and registering 3.03.15. Afra Khalifa Al Suwidi came in second place, riding Nad Al Sheba's Spectacular Goldie with a total ride time of 3.03.15. As of December 19, Shaikh Hamdan Bin Mohammed Al Maktoum of the UAE tops the Meydan Open Riders World Ranking. France's Lisa Riou is second, and JAE's Shaikh Rashid Dalmook Al Maktoum is third. The USA's Jeremy Reynolds is ranked 23rd, and Heather Reynolds is ranked 24th. In the Meydan Open Combination World Ranking, Great Britain's Linda Cowperthwaite and Maraday Mystaron rank first, with Czech Republic's Dana Hladisova and Dean second. Uruguay's Juan Lacasi and Rock and Roll are third. The highest USA ranking is Cody Boysen and Viktory Banner in 18th. Spanish bred horse Intisaar ranks first on the Meydan Open Horse World Ranking, with Australian bred Yamamah second, and LC Itati third. USA bred Reach for the Gold ranks 18th. In the Meydan Young Riders World Ranking, Argentina's Manuela Basombrio tops the chart, with Uruguay's Juan Pablo Viana Ponte second, and France's Cesar Donnais third. Canada's Emma Webb is 4th, and USA's Mallory Capps is 6th. Uruguay's Valentin Silva and Fadar Mahid rank first in the Meydan Young Riders Combination, with Uruguay's Cecilia Garcia and HLB Amira second, and France's Nina Lissarrague and Preume de Paute third. Coming in 4th and 5th are USA's Cassandra Roberts and CA Classy Marina, and Mallry Capps and Noslo's Lightning Strikes. The top 2 Meydan Young Riders Horses belong to Uruguay. Fadar Mahid is first, and HLB Amira is second. USA's Fringant is third. Dubai: In form UAE national team rider Shaikh Rashid Dalmook Al Maktoum notched his second win of the season on nine-year-old gelding Tonki Dee Boo Kokoda with victory in the 120-kilometre Emaar Endurance Challenge at Dubai International Endurance City on Saturday. Shaikh Rashid, who finished second behind His Highness Shaikh Mohammad Bin Rashid Al Maktoum, Vice-President and Prime Minister of the UAE and Ruler of Dubai, at the FEI World Endurance Championships in August at Euston Park in the UK, has since extended his form to the UAE’s domestic circuit. Shaikh Mohammad and Shaikh Hamdan Bin Mohammad Bin Rashid Al Maktoum, Crown Prince of Dubai, and Shaikh Mansour Bin Zayed Al Nahyan, Deputy Prime Minister and Minister for Presidential Affairs, attended Saturday’s ride. The Bronze medal winning Endurance GB Young Rider team of 2012 will parade alongside Olympic medal winning riders as part of Team GBR at the London International Horse Show, Olympia, on 19th December. The Young Rider team, consisting of Beth Langley, Carri Ann Dark, Kate Atkinson and Louise Rich along with chef d’equipe, Helen Boston, took the bronze medal at the FEI Young Riders European Endurance Championships 2012, held in Mont le Soie, Belgium in September. The British team were up against strong competition, with 58 riders from 19 countries, including 9 teams, taking part over the challenging 120km course at the championships. They put in a strong performance, completing the course at over 17km per hour, to take bronze. This is a significant result for the British Young Rider team and also represents the first medal won by a British Endurance team at any level since 2000. Andrew Theodorou and Dace Sainsbury, who was the highest placed British Individual at the Young Rider European Championships taking 12th place, made up the 6-strong Young Rider squad and will also attend the evening at Olympia. The success of the 2012 team has highlighted the wealth of talented riders taking part in the sport and puts the Young Rider Squad in a strong position as they prepare for the Young Rider World Championships to be held in Tarbes, in the South of France in July. Squad members, Carri Ann Dark and Beth Langley move on to seniors in 2013 and with such talented riders coming up through the levels, there is an exciting future for the British Endurance Team at international level. The riders are delighted to be involved in the parade of medal winners at Olympia. Carri Ann says, “This is a fabulous opportunity and one I will always remember. Endurance is a fantastic sport and it is great to show other disciplines that we can win medals too”. Australian Endurance lost a valuable member last night when Anne Jones succumbed to her long battle with cancer. Anne was indeed one of the true all rounders of Endurance. Anne was a competitive and successful rider amassing over 23,000 kms as well as being an administrator in our sport for almost 20 years. As a rider, Anne achieved 10 Tom Quilty buckles, 11 Faraway and 12 Shahzada completions and represented Australia in the 2005 WEC. Anne also crewed at several international competitions for Australia. As an Administrator, Anne was QERA Secretary for 18 years from 1992-1995 and then from 1999 until her recent resignation a few weeks ago. Simultaneously Anne was the AERA Secretary from 2002 until 2011 and was a Vice President for 2012. Anne was awarded Honorary membership of the AERA in March 2012 in recognition of her dedication and commitment to the Sport for almost 30 years. On behalf of the AERA and the Australian Endurance community, we offer our sincere condolences to Anne’s husband Brian, daughter Tracy and granddaughter Jade, and stepsons Darryl and Brad. The service to bid farewell to Anne will be held at 3pm on Tuesday 18th December at Drysdale’s Funeral Home, 27 Butler Street, Cooroy Tewantin Road, Tewantin – coming from the Cooroy side it is on the left about 500metres past the golf course. Anne loved bright colours so if you have them, please wear them. In lieu of flowers, Anne requested that donations are made to the Katie Rose Cottage Hospice, as this organisation is run by dedicated nurses and volunteers. Please visit their website: sunshinehospice.org.au/donations or fill out the attached form. ABU DHABI: Sheikh Hamed Dalmook Al Maktoum, won the Emirates Heritage Club Endurance Cup, a 120 km CEI two-star ride for Young and Junior Riders held on Saturday at the Bou Theib Endurance Village, Al Khatem Abu Dhabi. The ride was run over five stages of 30 kms, 30 kms, 24 kms, 20 kms and 16 kms. Riding nine-year old Colonial Boy from Seeh Al Salaam Stables, Sheikh Hamed finished the five stages in a time of four hours, 20 minutes and 10 seconds. Sheikh Hazza Bin Sultan Bin Zayed Al Nahyan gave away the trophies. Sheikh Suroor Bin Zayed Bin Mohammed Al Nahyan, Sheikh Mohammed Bin Khalifa Bin Khalid Al Nahyan and Sheikh Tahnoon Bin Khalifa Bin Khalid Al Nahyan were also present. The day also witnessed the Emirates Heritage Club Endurance Cup, a 100 kms CEN Ride for Privately Owned Horses which was held in four stages of 30 kms, 30 kms, 24 kms and 16 kms. Rashed Saeed Al Kamda, riding eight-year-old Jazz Danska, emerged the winner clocking three hours, 41 minutes and 47 seconds, followed by Ahmed Mohammed Saleh Al Shehhi on Jakin. After months of work building an idea, after years of playing sports with horses, we have formed a team to meet the needs of riders and owners on sports, nutrition and health for sport horses and riders. Our premise is for all our ideas concerning HORSERUN, the "responsible ownership," to sensitize owners and riders on the physical abilities of each animal and thus adapt the training of both to achieve a healthier more athletic ability. 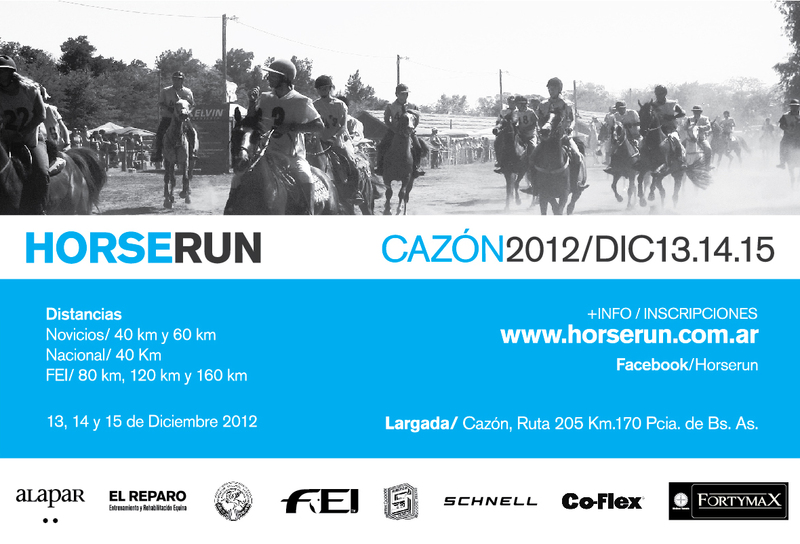 HorseRun 2012 will take place at Lagarda, Cazón Argentina on 13-15 December. . Distances will be 40, 60, 80- 120, and 160 km. Endurance GB celebrated what has been a great year for the sport, at an awards ceremony last week (6 December) at Daventry Court Hotel in Northampton. The highlight of the 2012 season was the bronze medal won by the British Young Rider Team at the European Young Rider Championships in Mont le Soie, Belgium. This is the first medal won by a British endurance team at any level since 2000. All of the team were in attendance, however, the star of the evening was Abigail Chisholm, from Devon, who was announced as both the Supreme National Endurance GB Champion and the Young Rider National Champion. Abigail rode her mother’s horse, Grey Medlar, to take the Supreme title, which is awarded to the pair with the most points in all types of rides over the endurance season. RIDERS lined up for the First World Military Endurance Horseride Championship, set to take place in Bahrain over the weekend, have stepped up the pace yesterday for the upcoming race, scheduled to take place on Saturday. Representatives of 19 teams taking part were present at the Bahrain International Endurance Village in Sakhir, where some riders conducted their first training session. Teams in the fray are the UK, Italy, Spain, Estonia, Azerbaijan, Uruguay, Brazil, Ecuador, Qatar, the UAE, Saudi Arabia, Kuwait, Oman, Iraq, Palestine, Jordan, Yemen, Morocco and Bahrain. Bahrain Royal Equestrian and Endurance Federation (Breef) is organising this first-of-its-kind global gathering in co-operation with the International Military Sports Council (CISM). Yesterday's training was witnessed by members of the Organizing Committee, being headed by Shaikh Khalid bin Hamad Al Khalifa, as well as the International Military Sports Council and teams delegations' officials. The organising committee, meanwhile, has finalised its preparations with only three days remaining for the start of this 120km ride. Rehearsals for the event, scheduled for tomorrow, continued yesterday at the village under the supervision of Royal Endurance Team manager Dr Khalid Ahmed Hassan. The final rehearsal to round off the preparations will take place today. The media guests invited to attend and cover the event for their respective publications, will start arriving today. The championship has received significant attention from sports media worldwide. More than 15 media representatives are coming to Bahrain for this purpose, including Italy's Luca Giannangeli, Eena Vanni and Giorgio Biffi, German photographer Barbara Miller, Brigitta Ernst of Germany's Dillingen, Alessandra Durazzano of Italy, Elise Wilson of Gulf News and Germany's Heidi Bernsdorff, photographer Julian Wagner. MORE teams continued to arrive in Bahrain as the countdown began for the first-ever CISM Military World Endurance Championship, set to take place at Bahrain International Endurance Village on Saturday. The Qatari delegation was among the first arriving in Bahrain yesterday, with other teams' representatives expected to reach the kingdom over the next two days. Delegations started arriving last Friday with Ecuador and Brazil being among the first. There are 19 countries from all over the world taking part, including the UK, Italy, Spain, Estonia, Azerbaijan and Uruguay. Also in the fray are teams from the UAE, Saudi Arabia, Kuwait, Oman, Iraq, Palestine Jordan, Yemen, Morocco and hosts Bahrain. The organising committee, headed by Bahrain Royal Equestrian and Endurance Federation (Breef) president Shaikh Khalid bin Hamad Al Khalifa, have stepped up the pace with six days remaining for flag-off. The committee overseeing the opening ceremony is preparing to hold the final rehearsals, being supervised by Royal Endurance Team manager Dr Khalid Ahmed Hassan. Several performances will be staged during the opening ceremony, including shows by the Military Music Band and the Mounted Military team while a special video presentation on the originality of Arabian horses in Bahrain is also planned on the occasion. The stables at the Endurance Village were open yesterday and some of the teams had their first training experience in Bahrain, while participants registration and accreditation were also conducted at the same venue. Spain's Juan Ruiz de Villa and Rev Beethoven are the winners of the 60th 2-day Santa Susanna Raid held near Barcelona, Spain, with a total ride time of 11:05.17 for the 120 kilometers. Spain's Alex Criville was second on Inguru in 11:22.16, and Spain's Maria Dulcet riding Lucero Miki was third in 11:25.53. Twenty riders out of 55 starters completed both days. The Santa Susanna ride is reportedly the oldest endurance ride in Europe, and one of the very few multi-day rides. It's a challenging ride with trails in the area of the Montseny mountains. Juan Ruiz de Villa riding Rev Beethoven won day 1 of the 60th annual Santa Susanna 2-day 200 km raid near Barcelona, Spain. They completed the 100 km by 18 minutes over Alex Criville and Inguru. Maria Dulcet and Lucero Miki finished in third place. Day 2 takes place today. Abu Dhabi: Teenager Khalifa Al Khalfan Al Jahouri made a stunning debut to win the CEN 100km Al Wathba Cup endurance ride at the Emirates International Endurance Village (EIEV) in Al Wathba on Friday, upstaging a strong field of 53 riders. The ride, which was held to support the small stables and private owners in the UAE, was attended by Shaikh Hamdan Bin Rashid Al Maktoum, Deputy Ruler of Dubai and UAE Minister of Finance, and Shaikh Mansour Bin Zayed Al Nahyan, Deputy Prime Minister and Minister of Presidential Affairs. Al Jahouri finished the first of five stages in third place but improved two places in the second stage before going on to win in a time of three hours, 50 minutes and 19 seconds with an average speed of 26.051km/h. He rode 12-year-old chestnut gelding Leo, who is owned by Saeed Suhail Ali Al Yabhouni. Abu Dhabi: Ali Reyad Saleh Al Kaabi rode a superb ride final loop in the 120-kilometre National Day Cup endurance ride to score a memorable maiden victory at the Emirates International Endurance Village in Al Wathba. Starting in fifth place on the final stage of the 16km loop, Al Kaabi and his mount Tacka increased their speed to 34kmph from the 27kmph they had registered over the first four stages. That effort was enough to fetch the Seih Assalam Stables’ trainer his first ever win and also helped him finish ahead of European Open champion Ali Khalfan Al Jahouri riding Lourizon Frost. Al Kaabi was 30th after the first 33kmph, 26th after the second stage of 27kms, 15th after the third stage of 24kms and 5th after the fourth stage of 20kms. FEI: What the hell, was wrong with the current regulations? Oh yeah, of course, it wasn't good for the wealthy riders. You know, the ones who have no time for getting to know their horse, train them, feed them, brush them, pet them, take care. It's easier if you want buy a car to go to the dealer -am I stupid, to send somebody, a henchman- and give orders for the tuning, then when the time comes to drive the car -of course you understand the parable- to mess up -because the engine is too powerful or too delicate- a few miles later. On the other hand, for the welfare of the horse, nada-niet-nothing! To counter the one killing horses, no sensational decision. Of course, a commission has been nominated -we all know the best way of doing nothing is to nominate a commission. Completely opaque. Who's making part? What is the road map? Let's bet that they will soon be employed in the UAE! The other, major, change concerns the qualification procedure. Was the system not good? It was and has always been OK for us, Europeans! Since years we were using it and never had problems. So as from now, another additional 80..90 must be completed to get access to the CEI* level. For the professionals, this means an additional cost-risk-time. For amateurs, especially the one bringing their horses slowly to the international level, no big deal. One more 50miles, that's OK, even better for the organizers. By Alan Marshall (ride secretary). Dec. 7, 2012, 10:04 a.m. THE last ride of the NSW Endurance Riders Assocation year was held at Sassafras on November 24 and 25 and was an 80 kilometre endurance ride. The weather forecasters got it right for a change, predicting 32 degree celcius heat and no rain. A 5am start saw 33 riders head out at first light into the wilds of Morton National Park. The first riders returned to the ride base in two hours and 12 minutes. After these 33 riders vetted, only 28 headed out for the second leg in the rising heat. AMBLESIDE endurance rider Kath McGhee is celebrating national awards as she and her horse Foxghyll’s Filly were out to prove a point this year. The Cumbria Endurance GB rider and her 20-year-old horse won three national trophies, including the Veteran Championship, and they finished second in the Senior National Championship. The Cotswold Trophy now belongs to McGhee, which is awarded to the pony (14.2hh or under) and senior rider combination gaining the most points in all types of competition rides. Human Barefoot Trends: What Can they Tell Us About Horses? Barefoot running and glove-like minimalist barefoot running shoes have gained popularity with human athletes in recent years. And, much like the shoes versus barefoot controversy in the horse world, the benefits and drawbacks of going shoeless are highly debated in human podiatry, said Nora Grenager, VMD, Dipl. ACVIM, of Grenager Equine Consulting in Middleburg, Va.
Grenager presented trends and topics in laminitis research at the 2012 Conference on the Equine Foot, which took place Nov. 2-3 in Monterey, Calif. That research included the work of Pat Reilly, chief of farrier services at University of Pennsylvania's New Bolton Center, who authored the paper "The Barefoot Paradox," which was published in the Journal of Equine Veterinary Science in October 2011 (Volume 31, Issue 10). Around 300 riders have been entered to bid for a dream line-up in the FEI 120km ** National Day Cup which marks the celebrations of the 41st anniversary of the National Day at the Emirates International Endurance Village in Al Wathba on Saturday, it was revealed on Wednesday. Meanwhile, the big event will be preceded by the running of the Al Wathba Cup for private owners only which will be held at the same venue on Friday. Speaking to newsmen at the Eastern Mangroves Hotel, the official hotel of the Shaikh Mansour bin Zayed Al Nahyan Globan Arabian Horse Racing Festival, Adnan Sultan, director general of the Abu Dhabi Equestrian Club and Lara Sawaya, director of the Shaikh Mansour bin Zayed Al Nahyan Globan Arabian Horse Racing Festival and head of IFAHR Ladies Racing briefed the media of the twin races and associated events. The Press conference was also attended by Mubarak Rashed Al Nuaimi, international promotion manager, Abu Dhabi Tourism and Culture Authority, Talal Al Hashmi of Abu Dhabi Sports Council, Stephen Bowey of Invest AD, Ahyam Ali Hamad, sales and marketing manager of Areej Al Ameerat. COWRA Arabian horse breeders Alan and Mark Lindsay have completed the Sassafras 80km endurance ride at Braidwood, with Alan’s home-bred mare Kintamani Charisma reaching a milestone of more than 5000km in successful rides. The mare is now 19 years young and looking a picture, relishing in her work, says Alan. She started the year well with a good 80km at Oberon, but in April suffered a severe hoof injury at a ride on the Southern Highlands and it was feared she would never compete again, leaving her short of the big 5000 by just 2km. While the UAE flat racing season is briskly moving through the gears, it’s encouraging to see that the endurance calendar is also flowing into a pattern with a regular series of rides. I guess if you love horse-related sports, you can’t but be attracted to the sport that has charmed almost every aspiring horseman and woman. But have you ever wondered what makes these long, arduous rides on horseback so appealing? It is something that people ask me all the time, and I’m afraid it’s a question that I have never been able to answer well enough. It’s not that I myself am not convinced of the sport’s merits, as endurance riding is not something to be taken lightly — it requires meticulous and demanding preparation and dedication. Jacqui Knight was 10 years old when she opened an English textbook and found an excerpt from ‘Tschiffely’s Ride’, one of several books written by Aimé Felix Tschiffely covering his epic journey with two Patagonian ponies, from Buenos Aires to Washington DC. Tschiffely’s destination had been New York but he found the traffic was too bad. And this was in 1925! The tale inspired her. For the next thirty years she pored over maps and clippings files in newspaper offices, read books about geography and travel and horses, studied mountains and rivers that might obstruct her path. And in 1996 her dream became a reality. New Zealand: Bit by Bit is the book Knight has published a book of the journey that she and a small dog took on horseback the length of New Zealand, from Bluff at the bottom of the South Island to Cape Reinga at the top of the North. It took her 105 days’ riding over a period of eleven months — a total of 2538.2 kilometres. She was was 46 but had been dreaming about the adventure for over thirty years. Jacqui just loves to share her beautiful country with visitors from overseas. She has entertained many people and advised them on what to see and where to go. Always, she warns that their visit will not be long enough. If you've ever dreamed about visiting New Zealand and getting 'off the beaten track'; if you love animals and wild places, if you love meeting people and learning about different cultures, then this book is for you. Jacqui has a natural, conversational way of writing which is easy to read. You will feel that you are travelling with her, her horses and Brae. Abby and Grey Medlar swept the board at the Awards Dinner for Endurance GB. The Supreme Champion 2012 is Abby Chisholm and Grey Medlar. Abby was also Young Rider Champion and Medlar achieved Best Purebred Arab. Medlar who is now 21, was also Supreme Champion in 2000 with mum Jo, in the last year of BERA. Abby (17) was also Young Rider Champion in 2010 with CFS Diana of Court, who is Junior Champion this year with 11 year old Saffron Bishop. Abby started riding Medlar in 2011, and Medlar has now achieved over 7500 competitive kilometres during his 15 year endurance career, with the next goal of 8000 km firmly in his sights for next year. Abu Dhabi: Around 300 riders have been entered for the FEI** 120km National Day Cup at the Emirates International Endurance Village in Al Wathba on Saturday, it was revealed on Wednesday. The National Day Cup event will be divided into five stages of 33km, 27km, 24km, 20km and 16km. The big event will be preceded by the running of the Al Wathba Cup for Private Owners, which will be held at the same venue on Friday. Adnan Sultan, Director-General of the Abu Dhabi Equestrian Club and Lara Sawaya, Director of the Shaikh Mansour Bin Zayed Al Nahyan Globan Arabian Horse Racing Festival and head of IFAHR Ladies Racing, announced the two events at the Eastern Mangroves Hotel on Wednesday. “Some of the top UAE and international riders are expected to take part,” Al Nuaimi said. “We are celebrating the 41st anniversary of the National Day and, on this occasion, we are delighted to provide plenty of good news for the contenders who will be lucky enough to take part in the ride. In the Al Wathba Cup for private owners, which is a CEN 100km ride, participants are required to cover the distance in four stages of 33km, 27km, 24km and 16km. Another total purse of Dhs500,000 plus a new car is up for grabs and so far 70 participants have been confirmed. Meanwhile, regarding arrangements for the World Arabian Horse Conference 2013, Sawaya said: “The details will be announced at 12 noon on 12/12/12 at the Four Seasons Hotel in Paris and 360 representatives will be covering the announcement. Sawaya also confirmed that the Polish Parliament has invited the Shaikh Mansour Bin Zayed Al Nahyan Global Arabian Horse Flat Racing Festival to address MPs on December 10 on its marketing and promotional plans before heading for France. Also present at Wednesday’s press conference were Mubarak Rasheed Al Nuaimi, International Promotion Manager for Abu Dhabi Tourism and Culture Authority (ADTCA), Talal Al Hashemi of Abu Dhabi Sports Council (ADSC), Stephen Bowey of Invest AD, and Ahyam Ali Hamad, Sales and Marketing Manager of Areej Ameerat. ABDUL-RAHMAN Al Zayed yesterday steered Maco Haka to victory in the Breef National Endurance Ride For Local Stables at Bahrain International Endurance Village in Sakhir. More than 50 riders, representing different stables and riding schools from all over Bahrain, competed in this fast-paced race which was over 100 kms. Participants came from Royal Endurance Team, Al Khalidiya, Ahmed Al Fateh, Al Shawamek, Al Muqheerat, Al Ajiyal, Saar Riding School, Khalid Al Ruwaie, Yusuf Ali Taher, Al Riffain and Al Asayel. Al Khalidiya Stable's Al Zayed proved the fastest, completing the race with a total ride time of three hours, 54 minutes and six seconds. Al Zayed's average speed was 25-km per hour and he crossed the finish line well ahead of Royal Team member Ali Busafar (4:03:53), who came second with an average speed of 24-km per hour. Ghazi Al Doseri, also of Royal Team, came third in 4:08:50 with an average speed of 24-km per hour. Organised byBahrain Royal Equestrian and Endurance Federation (Breef), the race was the second event of the 2012/13 season after the 80-km qualifying ride held earlier this month. The race was divided into four stages, starting with 30 kms for the first stage where Al Zayed reached the finish gate first in 1:10:40. He was followed by Bheem Singh (1:10:44) of Al Asayel Stable and Al Doseri (1:13:33) in second and third places, respectively. It was followed by another 30 kms for the second stage where Al Zayed (1:11:45) extended his lead over second-placed Al Doseri (1:13:21) and third-placed Singh (1:17:23). Al Zayed (48:17) continued to dominate the race in the third stage which was over 20 kms. Al Doseri (51:30) maintained second position, while Ali Safar (50:44) moved up to third. The fourth and final stage was also over 20 kms and the Al Khalidiya rider maintained his momentum and cruised to a well-earned victory. Royal Endurance Team captain Shaikh Nasser bin Hamad Al Khalifa and Breef president Shaikh Khalid bin Hamad Al Khalifa honoured the top three riders after the race. Shaikh Nasser congratulated the winners and wished other participants success in the next championship. On his part, Shaikh Khalid said the season opener lived up to expectations and was a fast-paced race. The Breef president thanked Shaikh Nasser, the Supreme Council for Youth and Sports president, for his continuous support to the federation's plans and programmes. Abu Dhabi: Al Hosn University student Aya Abdullah Reda Ishaq Ali stole the limelight by winning the 90km HH Shaikha Fatima Bint Mubarak Ladies Endurance Cup organised by the Shaikh Mansour Bin Zayed Al Nahyan Global Arabian Horse Flat Racing Festival as part of the UAE’s 41st National Day celebrations on Saturday. Riding 11-year-old Craig Royston O’ Roy, Aya took the lead in the second loop and led throughout the three remaining stages to win with more than three minutes to spare. Fatima Jasem Al Marri riding Trouble Maker finished second, while Bahrain’s Shaikha Bint Salman Al Khalifa on Magic Glen Harpoon was third. The ride, held under the patronage of Shaikh Mansour Bin Zayed Al Nahyan, UAE Deputy Prime Minister and Minister of Presidential Affairs, was attended by His Highness Shaikh Mohammad Bin Rashid Al Maktoum, Vice President and Prime Minister of the UAE and Ruler of Dubai, Shaikh Hamdan Bin Mohammad Bin Rashid Al Maktoum, Crown Prince of Dubai, and Shaikh Mansour, Deputy Prime Minister and Minister of Presidential Affairs, among other VIPs and guests. MORE than 50 riders will vie for glory today in the Breef National Endurance Ride for local stables at Bahrain International Endurance Village in Sakhir. Commencing at 6.30am, the 100-km ride is being organised by Bahrain Royal Equestrian and Endurance Federation (Breef). Participants from 10 stables and riding centres will be competing in the first event of the 2012/13 season. Royal Endurance Team, captained by Shaikh Nasser bin Hamad Al Khalifa, will head into this race as clear favorites. Other riders in the team are Eulaia Guardia, Ghazi Al Doseri, Alex Moral, Isa Al Hazza and Gurden Singh. The remaining stables in the fray are Ahmed Al Fateh, Al Shawamek, Al Muqheerat, Al Ajiyal, Saar Riding School, Khalid Al Ruwaie, Yusuf Ali Taher, Al Riffain and Al Asayel. Al Asayel stable with 16 riders have the highest number of participants. They include Abdulla Al Khatiri, Khamis Ahmed, Salem Sabt, Khalif Mubarak, Yousif Ahmed, Faisal Al Manea and Saud Al Hadrami. The race will be divided into four stages, starting with 30 kms for the first. It will be followed by another 30 kms for the second while the third and fourth stages will be over 20 kms each. The 2012-13 season got underway with an 80-km qualifying ride, organised earlier this month with its main objective being to prepare the riders for upcoming races. The federation, under the presidency of Shaikh Khalid bin Hamad Al Khalifa, has completed all preparations for this race. The veterinary examination took place yesterday at Endurance Village under the watchful eyes of the veterinary commission, headed by president Dr Ebrahim Yousif. Other commission officials are foreign veterinary delegate Dr Mohammed Al Hammad of Saudi Arabia, members Dr Abbas Al Haiki, Dr Sabah Al Kabie, Dr Abdelrahman Abu Shook and Dr Abu Obaidah Yaqoob. Bahrain's Dr Fareeda Abdulrazaq and Dr Caonabo Melo of the Dominican Republic are the treatment veterinarians while Mir Ghani is the village laboratory technician. The organising committee also elected the Ground Jury for the race. It includes president Ghalib Al Alawi and three members - Ali Ghuloom Hussain, Mahdi Al Kalaiti and Fahad Al Romaihi. Mohammed Dadulla is the foreign technical delegate, Haider Zubi was appointed chief steward while the ride steward is Abdulla Al Rumaihi. Shaikh Khalid welcomed all stables taking part in the second ride of the season, which he believes will see a grueling competition. He said the race is expected to be fast-paced and an opportunity for participants to try out new tactics. The Breef president expressed gratitude to Supreme Council for Youth and Sports, chaired by Shaikh Nasser bin Hamad Al Khalifa, for its continuous support to the federation. He also thanked federation officials, who have been working hard to prepare for the new season, and wished everyone success.